A North Shields-based charity has been given a financial lifeline to carry on helping the area’s hidden victims of domestic abuse. It has also received money from the Northumbria Police and Crime Commissioner Vera Baird to pay for a new crisis support worker. But, with its main income from the National Lottery Community Fund due to end in 18 months, the charity has to continue to work hard to raise money to ensure its much-needed services continue. 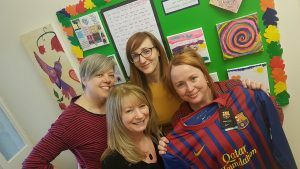 In August, for example, it is holding a Golf Day at Tynemouth Golf Club and has already been donated a football shirt by Barcelona – one of the world’s most famous teams – for the raffle. Young people between the ages of four and 18 are referred to Acorns by social services and other local agencies, brought by a parent or a family member, or – in the case of older teenagers – come forward themselves. As well as those it is able to help, there is also a long waiting list. “Domestic abuse is usually hidden from the outside world,” said manager Abby Burton, who joined the charity in May. 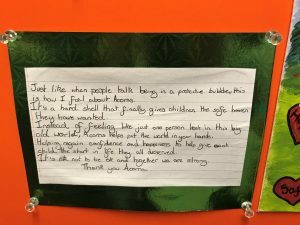 “But if you’re a child living in an abusive environment you can’t hide from what you experience, see and hear – and unless you get some support that experience is likely to have an effect on the rest of your life. The charity’s team of 11 provides counselling and play therapy at its base in Alma Place. One-to-one support is available in schools and within the community throughout North Tyneside. Acorns also provides a drop-in service at Alma Place for young people aged between 14 and 25 from 4-6 pm on Thursdays. From mid-June the drop-in service will move to the Linskill Centre in North Shields. Earlier this year the Government published its draft Domestic Abuse Bill which it said marked a milestone in protecting the two million adults who experienced abuse last year. Although welcoming the bill, leading children’s charities said it could do more for the 250,000 young children living with domestic violence in England. Despite a greater awareness of the extent of domestic abuse, its victims still need to rely on charities who depend on grants and donations to survive. The Northumberland Domestic Abuse Service, for example – which supports young people in the county – faced closure last month until the intervention of a local housing association. “Seeing how near that charity was to closing, makes us even more grateful for the support we’ve had from North Tyneside Council, Children in Need and the Police and Crime Commissioner,” said Abby, who hopes to raise more funds to recruit an apprentice, refurbish the Acorns building and turn its back yard into a garden. “We hear some really distressing stories from the families who access the service, but those who come along have confirmed it really does make a difference. Our role is to provide some immediate help and then provide support to ensure what they’ve gone through doesn’t unduly affect them for the rest of their lives,” she said.